My friend Kevin, who I mention quite a bit here because he is a hardworking farmer and all-around nice guy, showed up at our party with a big bag of carrots and an enormous quantity of gorgeous sweet potatoes as a gift. (This is why is it good to have friends who are veggie farmers.) I like sweet potatoes. But I also tiptoe around them a bit, because I live south of the Mason-Dixon line, where people—generally wonderful people who I respect and enjoy—like to tart them up with brown sugar or maple syrup and pie spices and marshmallows and call it a Thanksgiving side dish. We will not discuss this any longer for fear that I’ll offend someone. When sweet potatoes show up in such quantity, though, you can no longer afford to tiptoe. I cooked sweet potatoes every night for dinner for a week, stirring them into soups, cubing them into curries, and baking and loading them with herbs and onions and bacon, but I still hadn’t made much of a dent. Two people, it turns out, don’t eat very many sweet potatoes at a time. So when I put the plea out to the Internet, a nice person emailed me to set me straight: You need to make cake, she said. After a first loaf cake, I was hooked, and started pouring sweet potato cake batter into every type of cake pan I owned. In some ways, sweet potato acts a lot like a winter squash or pumpkin in a quick bread (similar to this recipe), helping create a dense, moist crumb, but the roasted sweet potato offers a flavor that’s a bit more caramelly and less vegetal. The Epicurious recipe I worked with proved pretty amenable to doubling and tripling, and cakes like these make good contributions to the freezer for easy defrosting later. Almost every recipe I found included icing, but I forwent it. We liked the cake best served warm with a pat of good salted butter. Preheat the oven to 375 degrees Fahrenheit. Poke the sweet potatoes all over with a fork. Roast directly on the oven rack until very tender, about 1 hour. Cool and halve the potatoes, then scoop out the soft flesh from the skins, place in a bowl, and mash it. Measure out two full cups of the mashed sweet potato. Lower the oven temperature to 325°F. Grease a 12-cup Bundt pan OR 2 loaf pans or 2 muffin pans. In a large mixing bowl, combine mashed sweet potatoes, sugar, and oil. Beat until smooth. Add eggs 2 at a time, beating well after each addition. Add the vanilla and mix to combine. Add flour, cinnamon, ginger, baking powder, baking soda, and salt to the bowl, and beat until just until blended. Pour or spoon the batter into the prepared pan and tap the pan or smooth the top to settle the batter. Bake until a tester inserted near center comes out clean, about 1 hour 5 minutes for a Bundt cake or loaf cake, and about 40 minutes for muffins, checking for doneness halfway through. Cool the cake in pan on rack 15 minutes. For Bundt and loaf cake, cut around sides of pan with a small knife to loosen. Turn out onto the rack and cool completely. And now I know what I want to make for a gathering this weekend! I serve them with Simply Recipe’s Slow Cooked Mexican Pork and curtido. I was given some sweet potatoes by a farm I recently WWOOFed at and made some sweet potato buns. I’ve never thought of making a cake with them. I think I’ll attempt the muffins. Wish I could go back to the farm and dig some sweet potatoes up myself. Congrats on the housewarming party. I’ve really enjoyed reading your stories. They give me a nice cozy warm feeling inside, and I have needed that badly since moving all the way across the world to a new country. I used this recipe. Hope you’ll like it. If you do make them, let me know how they turn out! I love the flexibility of how you wrote this recipe to accommodate whatever oil, sugar, and pan we want to use! thanks! This is the type of treat I want with sweet potatoes, rather than baked with marshmallows. I’m wishing for a surplus now so that I would have to make such a tasty sounding cake. 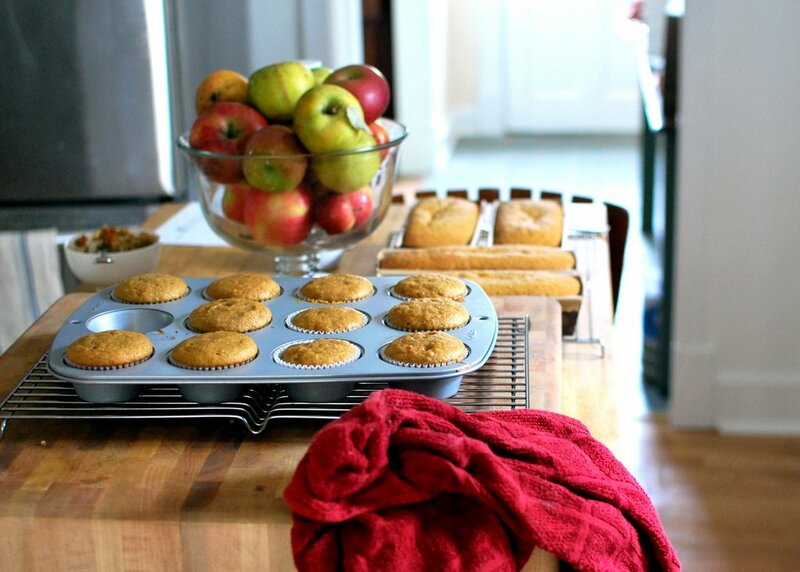 I love that picture of all the baking pans filled. You’ve got quite a production line there! this post is charming and delightful as usual – I imagine you were running out of cake pans faster than out of sweet potatoes. And I think your recipe is a relief in this flood of pumpkin related baked goods. Of course, they are tasty…but you kind of never hear the end of it. So thanks for sharing this beautiful and simple recipe and I am really looking forward to your pumpkin soup cooked in the shell. Chuckle over the um, Southern Sweet Potato problem (actually my extremely New England inlaws… they moved south to Massachusetts to give you an idea) had the marshmallow version for Thanksgiving. You never can tell with geography. Howsomever, my Seattle born and bred mother didn’t go for sweetnesses. She made a sweet potato casserole that layered cooked sliced sweet potatoes with sliced apples. There may have been a sprinkle of brown sugar, there was certainly butter. I thought it was a family recipe, but I found it in Fanny Farmer. It’s wonderful with pork, chicken, turkey. The apples are a terrific contrast with the sweet potatoes. Be very generous with the apples. Happy lovely house and thank you for your wonderful writings. These look delicious. Well, I’m British so to me sweet potatoes should always be savoury. Well, except for in the amazing chocolate chip sweet potato cookies in Joy The Bakers first book – if you have a copy make them, they’re my favourite Autumn treat! I made these as muffins yesterday, and they’re delicious! Do you think it would make a big difference if the amount of sugar was cut back? Yum, I love that this recipe is dairy free (as it gives me the tummy troubles). I don’t have loads of sweet potatoes but I do have bushels of butternut squash, so maybe I’ll try with that. Thanks! Peel and dice them, preheat the oven to 400 F, toss in a little olive oil, plenty of smoked Spanish paprika, garlic powder, chili powder, and salt, then roast them until they are crispy and soft and devour as a delicious side dish or as a snack on their own. The sweet-salty-smoky flavor will get to you and you won’t be able to stop eating them. My mother also makes a wonderful slow-roasted side dish of quartered peeled sweet potatoes drizzled with real maple syrup and topped in the last few minutes with chopped pecans. It’s divine. You have saved me from the glut of purple sweet potatoes in my CSA bags! Sweet potatoes are big in Okinawa, and Okinawan culture is big in Hawaii, and Okinawan sweet potatoes are purple. They are very, very sweet and very, very purple, and they taste a bit odd as a vegetable. I will try making some purple cake instead! YES I am so excited that you used ‘forwent’! I’ve never been brave enough to actually put it on paper so I squealed a little when I saw you had. Yay words! I love sweet potatoes! Just made a sweet potato cake a couple weeks ago and it did not last very long. Your no-frosting sweet potato cake got me thinking – I wonder what a sweet potato and cornmeal cake would taste like?? Yum! I love sweet potatoes and use them every week. Great to have a new recipe! I add them pureed with coconut milk to Thai curry. Thanks! 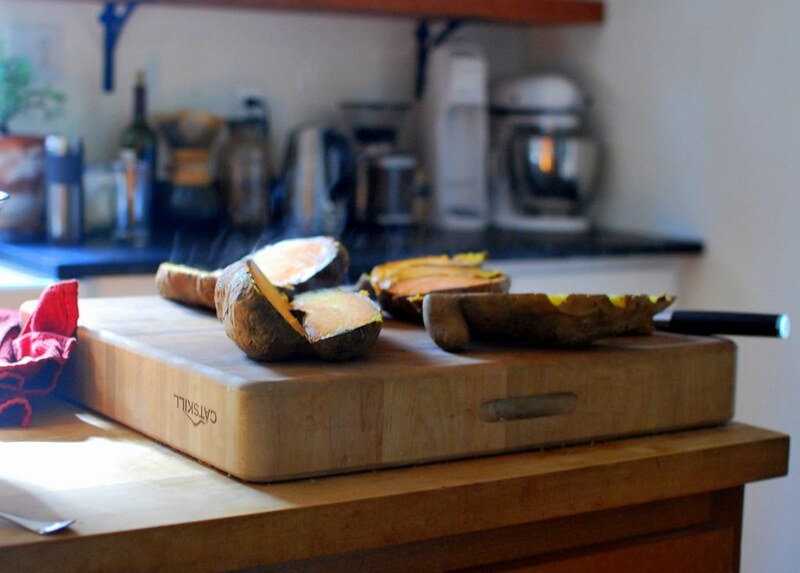 I love sweet potato anything, so seeing this recipe really excited me. I just tried them a few weeks ago and they are perfect. Sarah, what a gorgeous cake! Your directions make this seem like such an easy approach, too. I would love to make this soon! You are currently reading Sweet potato cake at The Yellow House.